Why Choose A1 Granite & Marble? With over a decade of experience in the granite, marble and quartz industry, we have been a reliable source for builders and consumers in and around Calgary since many years. We provide best quality granite, marble and quartz products for residential and commercial properties. State of the art Templating process giving accurate measurements of the counters using a camera. This templating method also provides digital photographs showing the actual scope of work. Giving precise profile finish to custom profiles which cannot be managed manually in a time sensitive production line. We have a job tracking system, providing accurate and prompt answers to questions regarding the production of tops. Allowing customers to view their kitchen in 3D, especially valuable with exotic materials showing how the veins are going to flow. Faster production, best quality, and a natural finished polish, on flat and bevel edges. Allowing faucet holes to be pre cut prior to installation, giving accurate, no mess installations. Inventory of 100+ pristine colors kept inside slab gallery for easy viewing especially in sub-zero temperatures. CAD Shop Drawings to see dimensions, seams, profile, and color. Checking all surfaces, edges, and final dimensions giving us the leading edge. 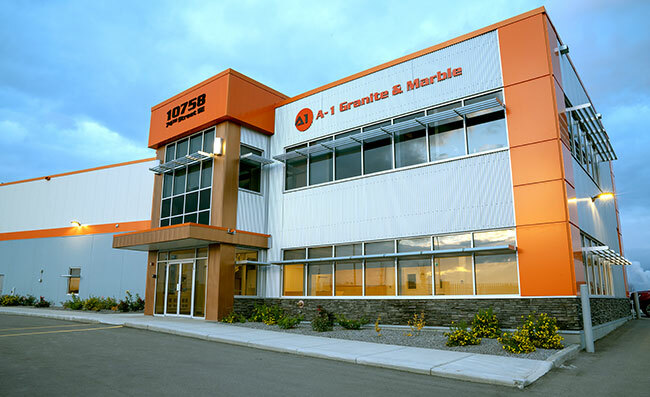 At A1 Granite & Marble we take extreme pride in our excellent reputation. We’ll go to great lengths to satisfy our customers. Our hope is that every customer will be so elated with their experience they’ll eagerly recommend us to their friends, neighbors, and business associates.